My youngest child bas been using a website called Reading Eggs to supplement what she is learning at school. It’s a subscription website that allows your child aged 2-12 to work on reading with fun games and puzzles. Disclosure: We received a subscription to the site to facilitate the review. All opinions are my own (and that of my child.) This post contains affiliate links. With your subscription you will receive access to 4 programs: Reading Eggs Junior (ages 2-4), Reading Eggs (ages 4-7), Reading Eggs Express (ages 7 – 13) and Math Seeds (a math program ages 3-9). Normally you can get a 2 week trial to try before you buy, but JUST for being a Callista’s Ramblings reader you can get a 4 week trial of Reading Eggs. Just click that link. I like that you get access to 4 different programs. 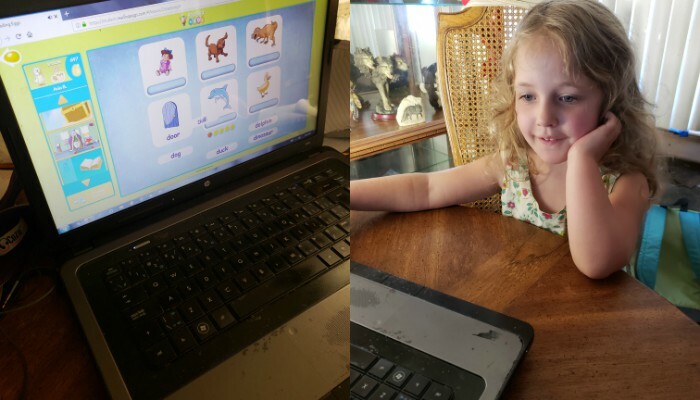 Since she is 4 she has played both the Junior and regular Reading Eggs games. The Junior is like a typical preschool game with easy games not just on reading but colours, shapes and animals too. They are easy enough to play with basic mouse skills. The regular program she can mostly do herself but I stay near for when she needs me. She isn’t retaining as much of it because she’s still so young but I can see that even in a few months between school and playing the games she should be starting to read small words. We haven’t tried the Math Seeds one yet because I was afraid doing math and reading together might confuse her so we’ll be trying that in a few months time. I also appreciate that the prices are reasonable. It is about $10 a month if you pay monthly BUT if you buy a year it’s only $59.95 which is a substantial savings. The price is for one child but you get 50% off the next child with one purchase. Schools can buy subscriptions and use the program too. If you think this is something you might be interested in for your son or daughter, check out Reading Eggs.